In an odd choice of marketing, The Second Doctor Box Set contains only one story featuring the Second Doctor. The second and concluding serial is, in fact, not a Doctor Who story at all but instead brings to life Terry Nation’s aborted North American Dalek pilot, ‘The Destroyers.’ As the crew of Explorer Base One comes under attack by the Daleks, Space Security Agents Sara Kingdom and Jason Corey discover a plan that threatens the entirety of the galaxy. 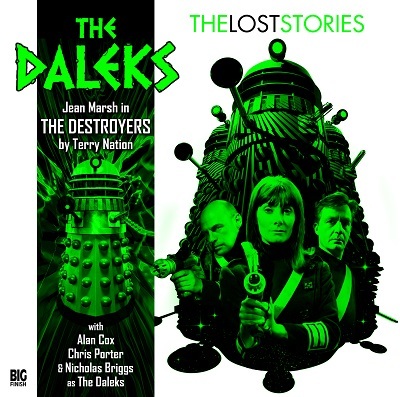 ‘The Destroyers,’ unsurprisingly, contains all of the expected tropes from a Terry nation script, meaning that there are prominent set action sequences, ruthless Daleks bent on conquering the Earth, tough space marines, and a harsh environment literally out to devour those within it. Strangely, though, the Daleks are almost secondary characters here, the script assuming that its intended audience is already familiar with the denizens of Skaro but inherently leaving expected newcomers at something of a disadvantage. The narration adapted from Nation’s stage directions does give some of the crucial information needed for the audio version, but the Daleks are more or less presented as single-minded machines with little nuance or explanation for their actions besides conquest. There would have presumably been plenty of more time to more thoroughly flesh out the Daleks in future episodes, but the titular foes are exceedingly straightforward during their brief appearances here and don’t necessarily provide the needed hook to ensure audience interest in a series centred around them even if they do remain true to their Doctor Who roots. This lack of characterization does bleed through to the Space Security Agents as well, but ‘The Destroyers’ makes it quite clear from the start that, at least as a pilot, this is a story based more on action and building to a strong cliffhanger where Earth rotates in space, oblivious to the impending Dalek assault, than it is on personal details and relationships. Still, in a story with both Daleks and androids, Jean Marsh truly manages to stand out as Sara Kingdom, a more vulnerable version than presented on Doctor Who but every bit the hero as she works her way through horror after horror to uncover the truth. As a narrator, Marsh also perfectly presents the necessary restrained but forceful gravitas for the escalating tension and evil presented. With a very personal connection to these events, Kingdom is the needed emotional anchor and easily supersedes the Daleks in their own story. Within a Doctor Who context, ‘The Destroyers’ has everything that an early Dalek serial should have. However, as a pilot for a totally new audience, it doesn’t quite provide all of the needed information to build up the Daleks afresh and instead relies on spectacle and anticipation of the Daleks’ brief appearances to drive the narrative to its building climax. Still, with Jamie Robertson’s superb sound design that provides a stunning period score and creates the needed ambience for this dangerous environment, ‘The Destroyers’ in an audio format recaptures the magic of ‘The Daleks’ Master Plan’ and Dalekmania effortlessly, and the re-emergence of Jean Marsh’s Sara Kingdom is an added bonus that only further solidifies the overall quality of this release.